It wasn't Israel. They are more civilized than that. It was Hamas! Hamas carried out a deadly purge of suspected informants in Gaza, killing as many as 18 people suspected of providing information to the Israel Defense Forces as fighting flared anew following the collapse of Egyptian-brokered cease-fire talks. Masked gunmen killed seven suspected informants for Israel near a Gaza City mosque as worshippers were ending midday prayers on Friday, according to a witness and Hamas media. 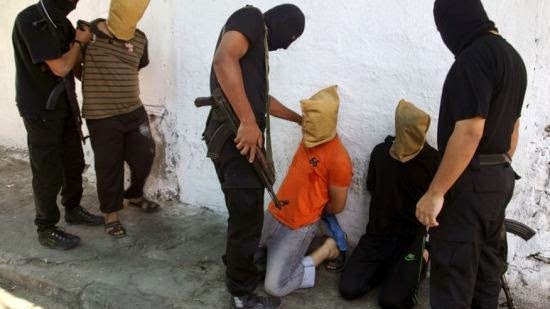 Earlier in the day, Hamas killed 11 men by firing squad in Gaza City’s police headquarters, according to the Hamas-run Al Rai website. Hamas media portrayed the killings as the beginning of a new crackdown, under the rallying cry of “choking the necks of the collaborators.” The killings, which took place near the al-Omari Mosque in downtown Gaza, occurred a day after Israel killed three top Hamas military commanders in an airstrike on a house in southern Gaza. A witness says masked gunmen lined up the seven men in a side street and opened fire on them. He spoke on condition of anonymity, fearing for his own safety.